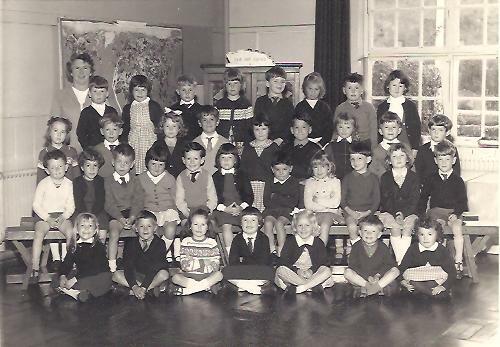 Shirley Hudd supplied this photo to the Strawberry Line Times in 2012 – it shows some of the children in Cheddar First School back in the day. But which day? This article appeared in the Strawberry Line Times Magazine in 2013 following a meeting with Shirley Hudd of Cheddar who spoke about some family photographs back in the day. Harry Mottram reported at the time. They are the faces that never fade. Those of the railwaymen who once peopled The Strawberry Line. 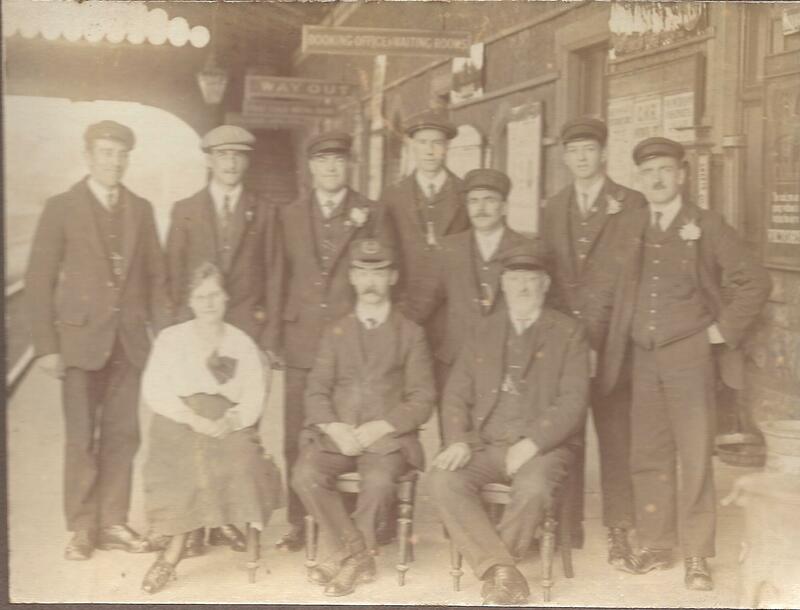 Standing in their working clothes for the camera they reveal young men in the prime – now all dead – for these were the workers of the Edwardian railway. The images are from a collection of family photos owned by Shirley Hudd of Cheddar who approached the Strawberry Line Times after reading the first issue of the magazine. 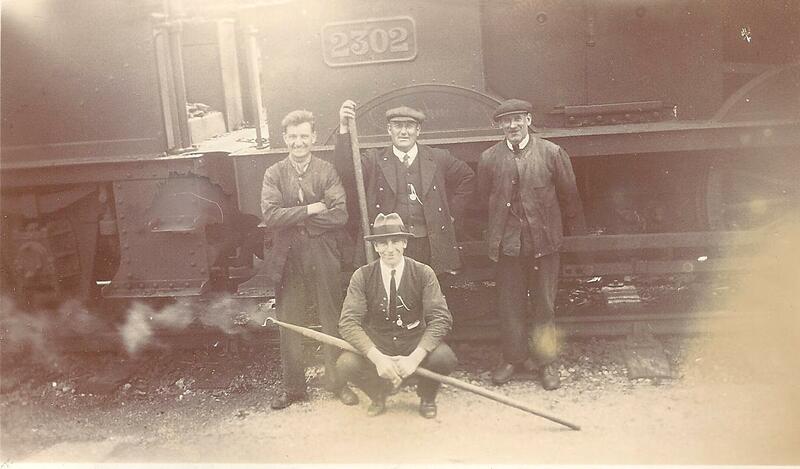 In the first of the images we see her father Bert Adams and three of his work colleagues at the shunting yard at Cheddar Railway Station. With shunting pole in hand Bert is in front of steam engine 2302. He sits on his haunches sporting a Palermo hat, waistcoat and pocket watch on a chain. He looks in charge, at the height of youth – a man happy at work with his mates taken in the 1920s when the memories of the First War were still all around while the fears of another were yet to sink in. A second photo from the same inter-war years reveals Bert with some more colleagues. 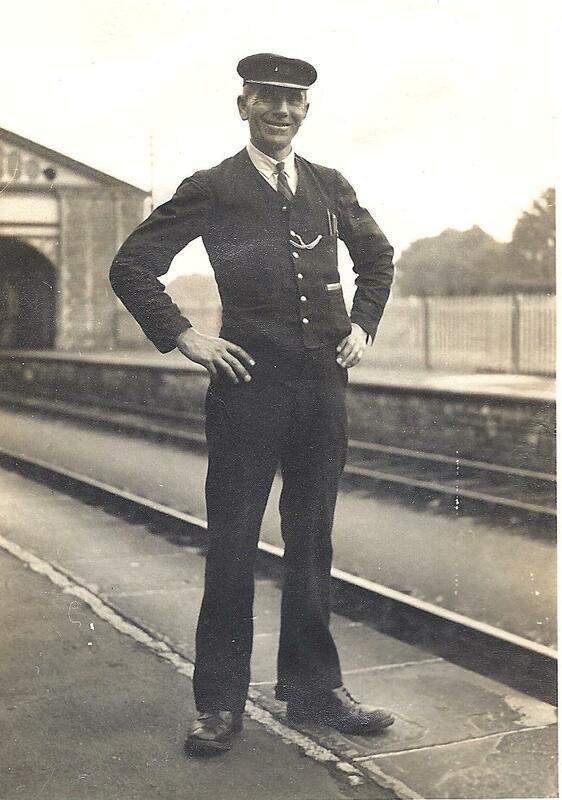 He has the uniform of a railway man complete with peak cap, buttoned collar and neat tie. Shirley said he worked for a time as a van boy as they were called – delivering parcels. His workmates wear the clothing of their tasks – with boots and heavy jackets – and note how their trousers are all short in length so they don’t trip over the hems while working. 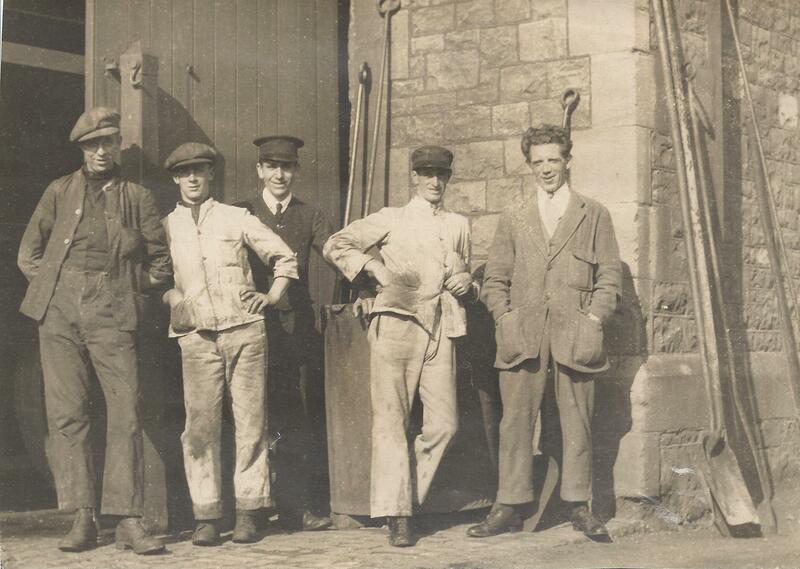 Perhaps you might be able to name the chaps standing in the light of a bright sunlight at Cheddar some time in the late 1920s or early 1930s. 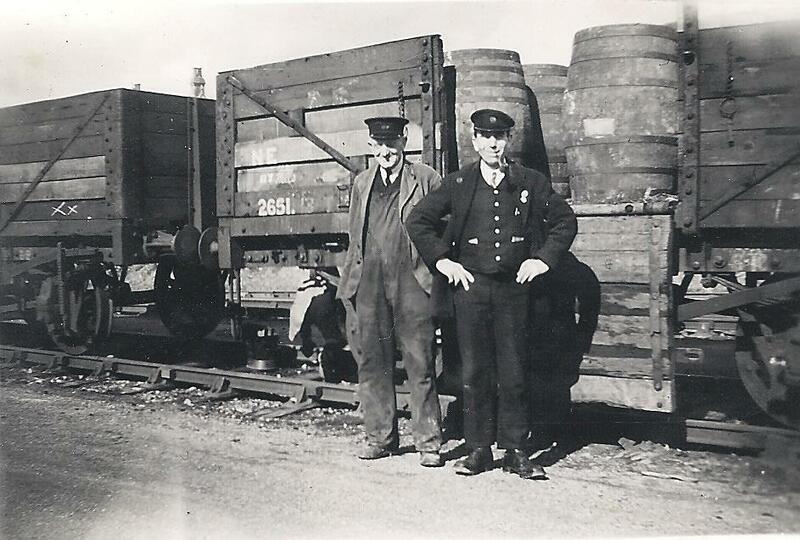 A third photo in the collection shows Bert with another railway man in front of what Shirley believes were barrels containing blackberries – once harvested along the valley for jam makers and transported to the factories by rail. If the nation’s taste for blackberry jam had taken off – then rather than the Strawberry Line it could have become the Blackberry Line instead! The fourth image is of Bert in his uniform standing on the platform in Cheddar with the station in the background with a neat white picket fence running along the side of the down side of the platform. He appears again in a more formal study – this time of a station staff in the village grouped on the platform near the Booking Office and Waiting Room. A poster concerning coal and Victory in the First World War help to date the image as does the prevalence of moustaches – clearly in fashion in era when all working men appeared to require a hat to complete their wardrobe. The lady in the photograph is thought to be an office worker – and she doesn’t feel at all coy about revealing her ankles in the shot – another sign of the times. One of the striking aspects is nobody appears to be over weight – there was rationing of some food in the 1914-18 war but life was generally more frugal in those days – plus of course everyone walked or cycled much more. Currently Bristol Water are building a pipeline from Cheddar to Barrow using part of the Strawberry Line as their conduit for the work. Before this work they wanted to construct a new reservoir next to the one in Cheddar but were eventually denied by Ofwat after the regulator ruled they could not put the huge cost on to the water bills on their customers. 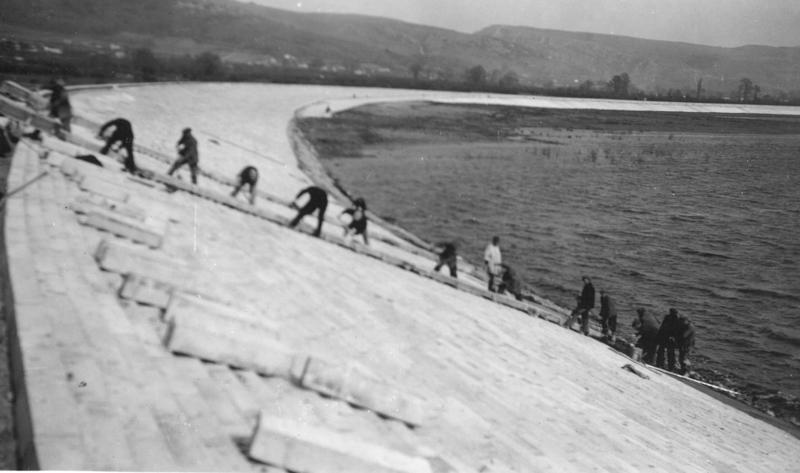 During that time they found photos of work in progress of the first reservoir built in the 1930s. This write up came to the Strawberry Line Times along with the photos. Cheddar has been a key part of our supply ‘grid’ for nearly 100 years. 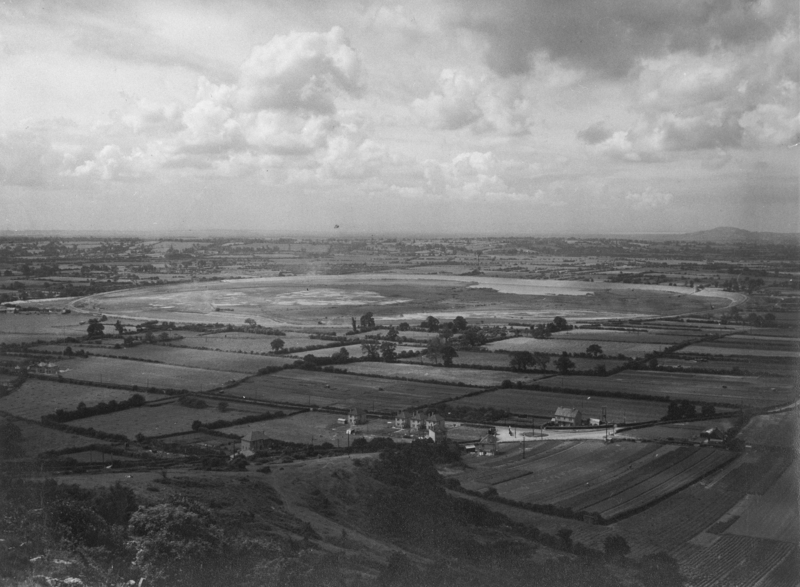 In 1914, it was decided to take water from Cheddar to increase supplies to Bristol. In early 1922 the dams and intake in the Gorge next to the Cliff Hotel were built and a pipeline laid to a pumping station in Lower New Road. Eventually, though, a reservoir was needed to make better use of water from the springs. 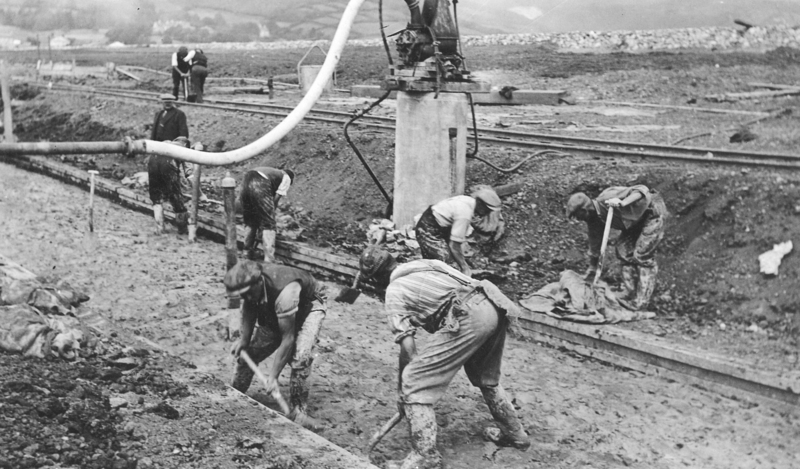 Work began in April 1933, with an estimated total cost of £450,000. The Company had actually wanted to build a much larger reservoir, or a second one as well, but funds did not allow. Work was suspended from October 1935 to March 1936 owing to incessant rain and the reservoir was commissioned in 1938. There is no record of an official opening. Over 400 men were employed on the site, with wooden huts provided for accommodation near the tower on the Axbridge side. As many of the ‘navvies’ were Irish Catholics, they had their own Priest. 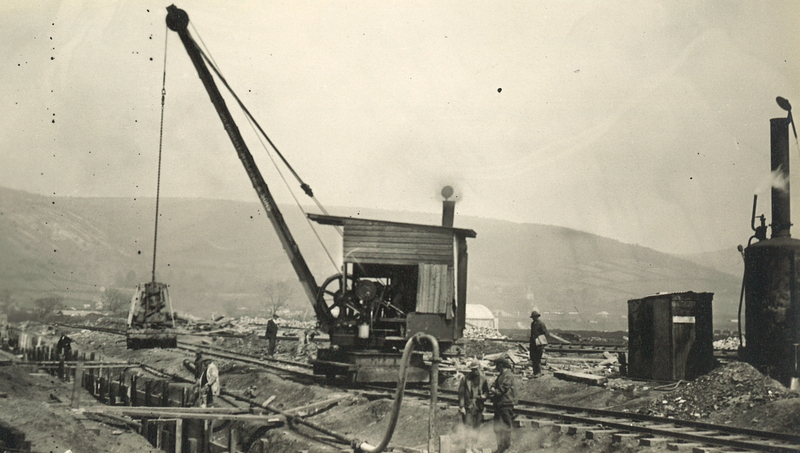 Raw manpower, horses, steam shovels and cranes were used to build the reservoir, with scant regard for health and safety! 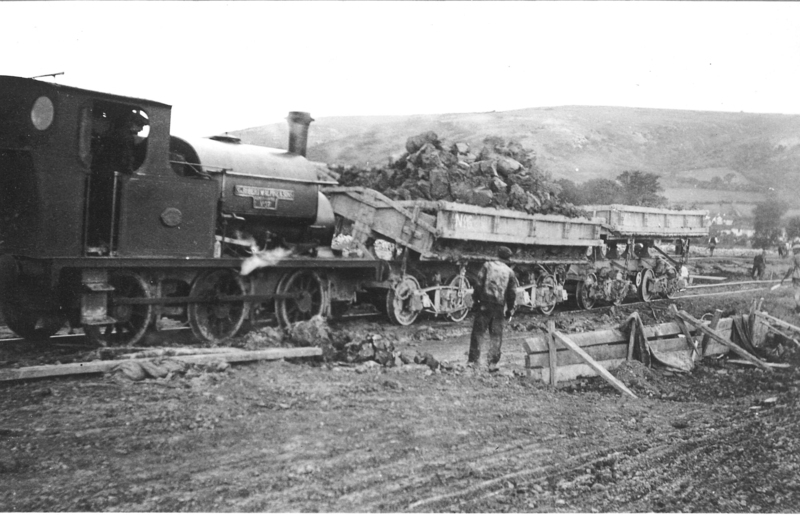 A branch of the Axbridge – Cheddar railway was built across the fields behind the sailing club to bring in materials. Bits of the machinery used in construction are buried around the reservoir, including, allegedly, a complete railway engine near the playing fields. The line of the A38 from the base of Shute Shelve to Lower Weare, incorrectly marked as Turnpike Road, was only constructed in the 1930’s. Before then all traffic going south from Bristol turned into the village of Cross on the, correctly named, Old Coach Road. It is difficult now to imagine this village noisy with the busy coaching trade but the clues are there in the fact that this small community still boasts two old coaching inns. The White Hart is documented in the early 17th century, but is undoubtedly older. The inn was larger than can be seen today having, on the east, coach houses and stabling. These buildings were converted in the mid 19th century into the terrace of cottages we see today. The New Inn recorded in a deed dated 1665 was at one time occupied by Soloman Trew, whose son Richard Trew became Mayor of Axbridge. It contains a room known as the Court Room where the Manor court was held each year to determine rents and deal with any land disputes. However there was a third inn known as the King’s Arms opposite the New Inn; this building is known today as Manor Farm. Its use as an inn can be dated as far back as 1647. On the same site was a large stable used to supply horses for coaches and travellers. It was also the destination of the Mail Coach that arrived daily in the morning at a quarter to 12. The Mail coaches were famed for their time keeping and villagers would gather to see it arrive to set their clocks and watches. Until the coming of the railway in Axbridge the village of Cross was important for the many coaches that travelled to Exeter and Plymouth every day with exotic names such as Comet and Eclipse. Parish Records and the census give some insight into the many occupations needed to service the coaching trade such as blacksmiths, wheelwrights and horse jobbers. The milestones that can still be seen beside the road show how many miles it is to Cross indicating its importance to travellers. Travelling at that time was often hazardous; many coach posters that have survived state arrival times followed it by the alarming statement “If God Permit”. Arriving at Cross to the warmth, safety and refreshments at any of the three inns must have lifted many travellers spirit. Well known travellers are recorded as having stayed in Cross these include William Wordsworth and Samuel Coleridge and the road engineer John MacAdam. Unfortunately none of these named have recorded in which of the three inns they had their lodging. With the coming of rail travel the age of coaching declined and the Kings Arms became a farm. The others sought new business: the White Hart advertised as a hotel, for example offering “accommodation for cyclists”, a growing pursuit in the 19th century. Hunts Directory of 1850 says of Cross “it formally appeared more bustling than at present – the cracking whip, the rattling wheels, the prancing horses and the sound of the coach horn, no longer enlivens this village”. The two remaining inns, now smaller in size, still offer hospitality to passing trade and local people as they have done for centuries. This article was for the Strawberry Line Times in 2013. Meanwhile Pam Avery of Winscombe was at school in Churchill. She wrote: “I remember the winter very well. It was my last winter at Churchill Comprehensive. Hilliers Lane was narrow then before the widening for the many coaches. The snow came up to the top of the hedges. My father worked for Somerset County Council at Shipham Quarry at the time and, as he could not get to work, he was asked to help with clearing the snow. 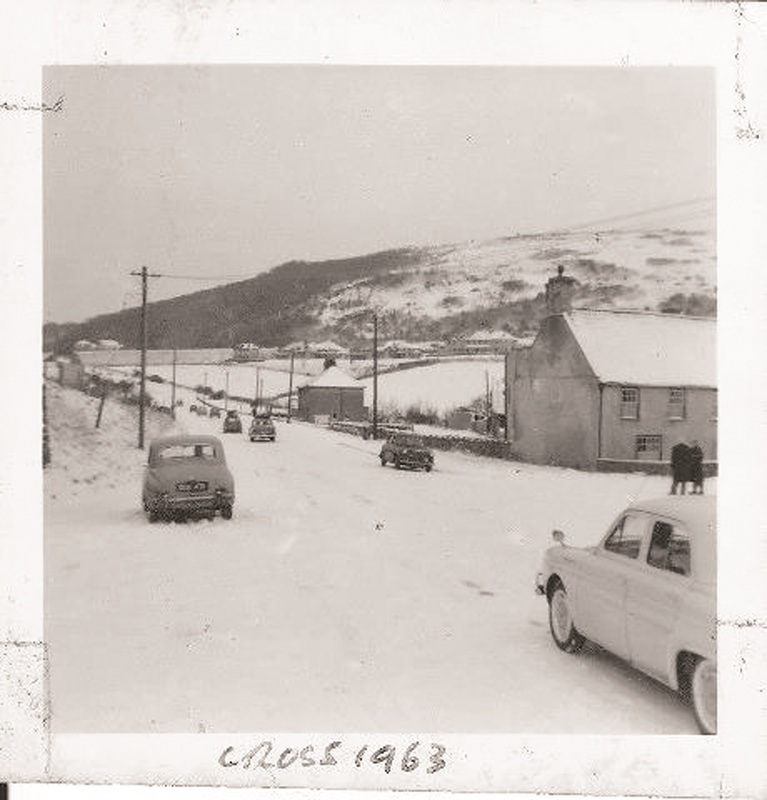 I remember the snow had blown into some beautiful shapes.” The Big Freeze 50 years ago clearly had a lasting impression. George Branch of Cheddar was a Shipham school boy at the time and his mother took a snap of the milkman. George had lent his sledge to the milkman Mr Wells who along with his son Geoff managed to deliver the milk to the villagers despite the ice using the sledge. Mr Evans had an open sided Bedford van for the round based in Winscombe and George said Shipham’s school was closed for two months in that winter due to the pipes freezing. Alex Duncan of Axbridge wrote in: “I found Hugh Alsop’s article on the Strawberry Line very interesting. In 1946 I lived in Banwell and gained a place at Wells Blue School. To get there I had to cycle over a mile to Sandford and Banwell Station, store my bike in an outhouse and board the train. It was a harsh winter back in 1946/47. I had a half size bike with no gears and toiling up through Towerhead on snowy roads was an arduous experience. There was no thermal clothing either in those days. Every schoolboy wore grey shorts, long socks, lace-up shoes and an inadequate gaberdine raincoat Can you imagine it, shorts during that winter! Oh! I forgot something. We also wore a school cap – not much comfort in that. Anyhow, what of the train itself? “Railway carriages were not open-plan in those days. The compartments provided a degree of privacy. There was room for six people seated three each side or more if you squeezed up and a corridor along the side of the carriage linking them together and also leading to the toilets at either end. However, Hugh Alsop is right. Many carriages were of the non-corridor type which had room for eight people per compartment and no toilets. They were OK on short commuter routes but to a bunch of school kids they were a godsend. I will leave to your imagination what went on with us naughty boys during the trip through Shute Shelve tunnel. Finally we have received a lovely photo from Shirley Hudd of Cheddar. It’s of children enjoying a special celebration: that of peace. They stand in the afternoon sun of Tuesday 8 May 1945 – VE Day. Or was it? Shirley Hudd of Cheddar has sent in this photograph of herself dressed as a nurse in a fancy dress parade held in Cheddar on the grounds of what was to become Kings of Wessex Academy. She’s not completely sure of the date. In the distance are the Mendip Hills and the chimneys of the village houses. The bank is the railway embankment of the Strawberry Line complete with arched bridge. Now Shirley is fairly sure the photo was taken around the time of VE day but it may have been the anniversary of the celebration a year or so later. Any ideas? Do you recognise anyone in the photo? Do you have memories you’d like to share of the Strawberry Line District? There’s been an enchanting glimpse into the world of Axbridge Carnival in the 1980s via a Facebook site last week. 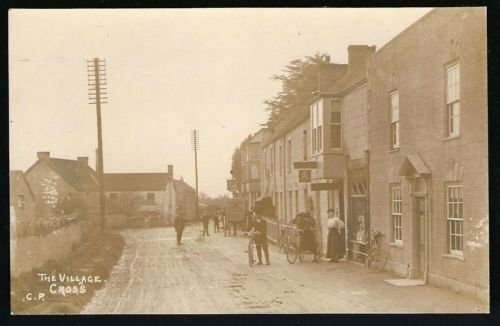 The Old Axbridge Photos And New site is a shared collection of memories of those who live or used to live in the town. The highlights are the photos of events and places posted by the members. Recently lots of images of the carnival have been put up – revealing an era of lost innocence for some and of golden memories for others. What’s remarkable about the carnival is it still continues every September – and unlike its rather illustrious counterparts in the county is held in the afternoon and coincides with the Blackberry Fair held in the Square. This image of Axbridge Square is delicious for its detail. It was probably taken around 1972. Taken from the window of the Oakhouse Hotel it shows the scene as it was not long after through traffic ceased to pass along the narrow High Street – partially blocked by work progressing over at King John’s Hunting Lodge. Also the new cobbled surface so hotly discussed at the town council is is yet to be laid. The shop on the corner is still there – now the Cooperative – while the Lamb has no seats and tables outside the front. The layout for parking has changed considerably from what was then something of a free for all. There was a heated debate in the town council about the laying of the new surface – now all but forgotten. As you speed along the A38 along the Churchill straight towards Bristol you pass a layby where a van sells teas and coffee. Picking up speed you head down towards the s-bends before the green at Havyatt. You might be surprised to know that before this new stretch of the main road was built and the road went down through Lower Langford a railway cut across the land. Running from Congresbury the track wound its way to Wrington and on to Blagdon. This is a rare photograph of staff at Langford station. The Wrington Light Railway ran from 1901 to 1950 and was originally built to take building materials for the construction of Blagdon reservoir. Before the First World War there were four trains a day from Blagdon to Yatton – including a late night Saturday service for those Edwardian live wires who liked to let their hair down in down town Yatton. Now here’s a charming photograph taken long before mobile phones were equipped with digital cameras. It shows how transport has changed from horse power to car power. It’s from a Facebook site beloved by fans of Axbridge’s past and shows a family in Banwell in 1904 outside Banwell Castle. William Parsons who lives at the castle today posted the image of Martha Durston of Axbridge, her daughter Polly and husband Mr Stayner of Banwell and their children Albert and Eva. With just the odd car, bicycle or horse and cart Yatton’s High Street was a darned site easier to go down 50 years ago compared to today. If anyone can pin point exactly where this is along the narrow street we’d like to know. Now there’s a 20mph speed limit in places and with parking permitted along some stretches the road becomes a bottleneck with long queues – and worse still cars mounting the pavement scattering the pedestrians as they try to get past. Fri 17 May. Local history. A once mighty industry in the Strawberry Line District that now is covered in weeds – what could it be? Where is this strange building? Dog walkers in Sandford will recognise the former lime kilns in quarry wood in the wooded hill off Quarry Road. The stone kilns come in all shapes and sizes and although hardly any are in use today they once were common industrial buildings dotted across the country. They were essentially a coal fired furnace to produce quicklime through the calcification of limestone layered into the coal – a rock in plentiful supply locally. Quicklime was (and is) used in many types of manufacturing including agriculture. When burnt it produces a glowing light – and was once used in theatres to light the stage – hence the term limelight. Cement making required quicklime, as did plaster and fertiliser. Although it is still made on an industrial scale – these kilns with their egg-shaped interiors are no longer used. A pity – as it can be darned cold on Quarry Road – and nice furnace would be popular with frozen dog walkers. One lived in a haystack, one joined the Serbian army and another bought her own gondola. Another who lived in the Strawberry Line village of Banwell founded a fire station and a marching band. The world would be a much duller place without that most individual of human beings: the female eccentric. Flora Sandes was the only woman from Britain to join the Serbian army and fight the advancing Austrians in the First World War. Louisa (no known surname) lived in a haystack near Congresbury in the late 18th century and for a time was something of a celebrity with fashionable visitors riding out to visit her. Hannah More took a shine to her and described her as “handsome, young, interesting, enough Mistress of her reason carefully to shut up from our observation every avenue that might lead to her secret.” And then there was Marie Corelli from Stratford-upon-Avon who owned a gondola and boated up and down the River Avon while writing best-selling gothic fantasy novels. And finally we have Emily Fazakerley from Banwell. Our very own Strawberry Line female eccentric. Born in Ynys Mon, Cymbru, in 1840 she was the daughter of Henry Fazakerley of Fazakerley House Lancashire, and lived in Plas Castell at Denbigh Castle and was educated in London. Emily moved to Banwell Abbey in 1883 for health reasons and was to leave a lasting impression when she arrived by train on the Strawberry Line at Banwell and Sandford Station. Looking slightly severe in her funereal black gown the Welsh aristocrat cut an exotic image of a cross between Mary Poppins and Queen Victoria – who was the fashion trend setter of the era. Described as a “wealthy, eccentric, lady bountiful” by Roy Rice of the village’s history society, the wealthy spinster of the parish was noted for her acts of generosity to the community. These included donating land and a cottage to set up a fire station in 1887, and buying a horse drawn fire engine and uniforms for the new fire brigade. Clearly Emily had an eye for theatre as she established a brass band with instruments and had special uniforms for the musicians made by Mr Lewis the village tailor. Once she had moved into the Abbey in Banwell (what is left is now flats) Emily took a keen interest in the social life of the village. In the 19th century the village was like many in England – suffering from unemployment and in particular a lack of social services. Although the Education Act of 1870 had begun to provide elementary state education there was no formal provision for training and further education. Poverty was a problem and the utilities, health service and emergency services we take for granted barely existed. One of her acts was to install the fire brigade – many homes were still thatched and all houses used open fires for heating and some cooking – although kitchen ranges were increasingly being installed. However the threat of fire was considerable to the tightly packed homes of the village – so the fire brigade was just what Banwell needed. And her philanthropy didn’t end there. Banwell’s History Society recorded that: “On a sudden whim, she would invite all the women in the village to tea and they, numbering as many as 50, would march through the village escorted by the band. They were not only entertained to tea but sent home loaded with blankets, sheets, tea and every kind of household utensil – to the value of about £50 (a considerable sum in those days). 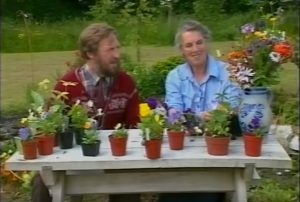 When a tinker called at the Abbey she would sometimes purchase his entire stock – brushes, pans etc. to build up her stock of gifts to give to the village.” However it seems that young fit men in dark uniforms – in particular the firemen of the village’s fire station and the village’s brass band that she founded– were her first loves. One of the band – the late Fred Day – recalled “Miss Fazakerley took a great interest in the band and invited it to play at the Abbey on many occasions – we used to go there nearly every night. We didn’t know many tunes and were not much of a band, but we used to struggle through two or three numbers such as Rule Britannia. However, she seemed very pleased with us and after we had played would call out to the Butler “Cornelius, march them to supper”. And what a supper it was.” Cornelius the butler was also called upon to set light to bonfires in the grounds of the Abbey – so she could invite the firemen to demonstrate how effective they were. Whether these were official hoax calls is unclear – but then if you’ve paid for the fire brigade’s creation it is only fair you can call them out occasionally for your own amusement. Another passion of the extraordinary Miss Fazakerley was her legendary shopping trips to Bristol where she would sometimes hire a special steam train on the Strawberry Line. Setting off from Banwell and Sandford Railway Station accompanied by her staff and waited upon by Cornelius the butler she visited the chic shops of Bristol’s Corn Street, Victoria Street and Castle Street – no doubt stopping for lunch at the Tudor Dutch House on the corner of Wine Street and High Street. The friend of tinkers and the poor, founder of fire stations and village bands it seemed the eccentric Miss Fazakerley could do no wrong. That was until the incident of the church clock. It was one innovation too far. St Andrews parish church was in need of a new clock and so in her own individual way Miss Fazakerley had one brought from her family home in Denbigh Castle and paid for the workmen to have it installed on the church tower. Lit by gas which automatically switched on at night it appeared to be the perfect timepiece. However this was the 19th century and folks weren’t so keen on all modernisations. It would be the equivalent of a vast digital clock being put there today along with neon lighting. It would do the job but somehow not in the right way. The villages took against the new clock and made their feelings felt. It must have been a painful moment in the relationship between the parishioners and Emily – but she got the message and had the clock removed. A short time late the villagers replaced it with a clock of their own choosing – which is still there to this day. Oh well… you can’t win them all. In 1888 Miss Fazakerley died at the age of 48. Her death stunned the village with the residents in genuine shock. Her frail and imp-like body was laid in an oak and lead coffin and placed in state in the Abbey chapel. Hundreds of mourners visited the coffin to pay their last respects – an act of homage and respect that has largely disappeared in our own times. Her final journey was fittingly by horse and carriage to Banwell and Sandford station where her coffin was taken to London to be buried in the family plot. But it was a departure that combined her two defining characteristics: public theatre and community spirit. Accompanied by the Banwell Fire Brigade and of the village brass band hundreds of mourners made up of residents, family members and friends walked at funereal pace the mile or so to the station while in the distance could be heard the tolling of the church bell – rung in her honour. One obituary recorded: “To give a general estimate of her character is a pleasing and by no means a difficult task. The impression that has gone abroad concerning her, needs modification. Her eccentricities and naturally excitable temper left sometimes a wrong impression. Her very follies leaned to virtues side. Her failings were her virtue. She was generous even to a fault. Her concern for the poor during the recent very severe weather was sometimes painful to witness. She had an idea that they were dying of hunger and cold and that she must provide them with soup, bread, meat, coals and clothing. Her one aim was to do well, and had her life been spared she would have done still more good. As it is, she has left her mark upon Banwell so deeply engraved that while one of the present inhabitants still survive, her name will be held in grateful remembrance. Well may it be said “She was a lady, take her for all in all, we shall not look upon her like again”.” At the beginning of this article I called Emily a Great British eccentric – or words to that effect. But perhaps she was not an eccentric but rather an individual. Are not eccentrics simply people who do as they wish and are not bothered by the opinions of others and the conventions of society? Individuals who are happy as themselves. Why we need to pick them is perhaps more to do with the fact that most of us are not particularly unusual. We blend in almost unnoticed in society – which is the way we like it. While Emily was certainly an individual – and although she was rich and could as she chose – you don’t have to be wealthy to be called an eccentric as Louisa in the haystack proved – a lady who we may well revisit in a future issue. Acknowledgements to Roy Rice on his history of the Banwell Fire Brigade. Thu 16 May. Look Back. The mysterious stone on the corner of a Strawberry Line Street – does it have magical powers? It looks like something that fell off a passing quarry lorry. But the Butstone in Banwell has a long and mysterious history. Located on the corner of West Street and Church Lane the rock butts up out of the pavement – seemingly protecting the shop fronts from lorries who use the narrow pavement as they drive through the village for extra lee way – and acting as an unofficial island for pedestrians when flood water pours down the hill. It’s been there as long as anyone can remember. Roy Rice who has charted much of the village’s history said it is on a 1770 map drawn by Edward Tuckey who was parish clerk, tombstone maker and landlord of the Bell Inn. He said: “The stone was knocked out by a lorry some years ago but Brother and I concreted in back in with a brass plate underneath saying what happened. There was a harness maker in the shop there(Butstone House) but that was 20th century.” Some in the village believe the rock has magical powers while others believe if the stone is removed then the village will suffer a natural disaster. One theory is that it was used in the distant past as a convenient mounting block for horse riders struggling to get into the saddle – and it was simply left there as it was too large to roll away. Whatever its origins there’s little doubt it is now part of the village’s heritage and is a popular touch stone for residents who believe it brings good luck. By contributor Theresa Roche Gloria Sheaves was born on 28 April 1913 at Stour-Row near Shaftesbury in Dorset, the fifth child born into a family of cattle farmers. She was christened Gwendoline Marjorie Allard. One of her earliest memories was around the time of her sixth birthday seeing bluebells growing around the family farm. “I never thought I’d grow up to be a Bluebell girl,” she said.At the age of seven she was sent to St Margaret’s Boarding School in Burnham-on-Sea where her love affair with dance began with her first ballet and ballroom dance lessons.Miss Chevitt picked Gloria out and gave her special tuition. During her school holidays Gloria would take the family gramophone into the barn and practice her dance steps. By the time she left school Gloria was dancing at professional standard and could face auditions.After debuting as a dancer on the London stage, Gloria took the stage name Leonie Allard and left England to become a member of the renowned Bluebell Dance Troupe at the world famous cabaret The Moulin Rouge in Paris.As well as dancing in the chorus line of can-can girls, Gloria was selected by Madame Bluebell for a Spanish dance routine, for jazz cabaret and for an oriental speciality dance involving back bends and acrobatic movement. In 1934 not many people travelled abroad and Gloria recalled how adventurous she was considered to be. Paris itself was considered risqué and she was a young woman alone. “We were considered very daring you know in those days. Kicking our legs high up in the air while performing our can-can routine. We were scantily clad too. But we never behaved improperly with any of the men.” On leaving the Moulin Rouge Gloria then danced in cabaret acts in Czechoslovakia, Hungry and Romania. Gloria once showed me some of the publicity photos she had done. “They were taken at a Bond Street studio in about 1937. Well, they got me the jobs, anyway,” she said referring to photos of herself in an oriental belly-dancer costume. World War II brought Gloria back to London where she danced in London’s West End during the war. In 1941 Gloria met Richard Sheaves. They married in 1942 after a whirlwind romance. Shortly afterwards he was sent off to war, to Egypt. Gloria carried on dancing and her husband returned after the war to enjoy over 60 years of marriage. Blessed with a daughter in 1945 Gloria decided to leave the stage and in 1953, now calling herself ‘Gloria Sheaves’, she founded the Gloria Sheaves School of Dance in Southmead, Bristol. As her reputation for quality tuition soared, pupils flocked to her. In addition to holding teaching qualifications in Ballroom and Latin dancing her invaluable stage experience and choreographical skills enabled her pupils to gain professional work as dancers both in the Hughie Green show in the 1970s, in Warner holiday camps and on the original Come Dancing programme.